Tim Solso was elected to Ball Corporation’s board of directors in January 2003 and became lead independent director in April 2013. 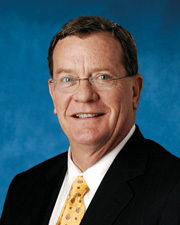 He is the retired chairman and chief executive officer of Cummins Inc. Mr. Solso had been with Cummins since 1971 and, from 2000 through 2011, was chairman and CEO of the Columbus, Ind., manufacturer of electrical power generation systems, engines and related technologies. In addition to his directorship at Ball, Mr. Solso serves as chairman, Cummins Foundation, which supports environmental, educational and social justice initiatives in the communities where Cummins operates. He is the U.S. chairman of the U.S. – Brazil CEO Forum. He is a member of the board of Ashland Inc., the American Transportation Research Institute and is a member of the Business Roundtable. He also serves on the board of General Motors, Board of the Initiative for Global Development, Earth University and the Earth University Foundation. Among his notable honors, Mr. Solso was awarded the Ellis Island Medal of Honor in 2008; was selected as the national Six Sigma CEO of the year in 2007; and, in early 2009, was awarded the William R. Laws Human Rights Award by the Human Rights Commission of Columbus, Ind., where Cummins is headquartered. Mr. Solso earned his bachelor’s degree at DePauw University in 1969 and his MBA from Harvard University in 1971.